High strength composite material (SMC) or engineering plastic injection molding, good mechanical performance, elegant appearance, sturdiness and durability . Suitable for indoor and outdoor , wall-mounted, pole, aerial installation . Turn-over structure, layout is reasonable with splicing zone below and distribution zone above . FC,SC,and LC adapters available, modular design, convenient for fixation and maintenance . Fiber route reasonable, fiber bending radius at any place is greater than 30 mm . The mark is clear on each fiber connection and distribution . The door opening angle is greater than 120 degree for easy operation and maintenance . 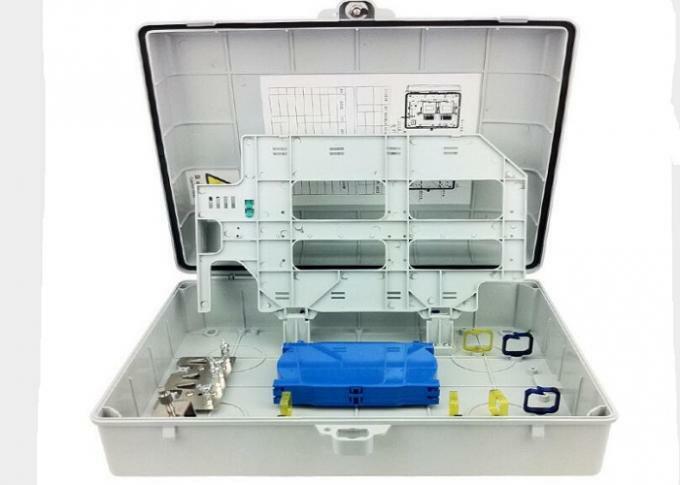 The splice tray can be taken down and put on the bench for splicing, convenient operation . The redundant fiber is wound and protected. Melt receive flip type design simple to use, melting with complete separation of fine points fibre layout more reasonable.